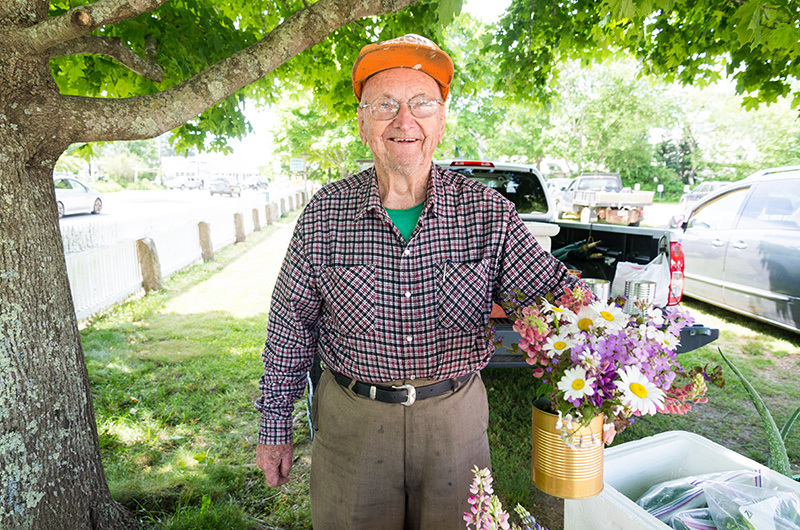 Bob Daniels delights in the West Tisbury farmer's market year after year. I like my vegetables as much as the next guy, but lately I’ve been feeling out of place at the West Tisbury Farmers’ Market. Admittedly, I’ve never felt reverential about chard and arugula and still haven’t jumped on the kale bandwagon. It’s not just the exotic vegetables, but the oat soap and green olive gluten-free tapenade, the Maitake mushrooms, squash blossoms, smoked peppercorn pesto and kombucha. My first inkling of feeling out of place occurred on July 9, 2017, the day when dogs were banned from the market. No more outings for Milo. A more hygienic, less Labradoodly venue. Lots of hurt feelings and squeals. It’s hardly how I remember growing up in Ohio, watching Lassie on Sunday nights: Jeff plowing the North 40, chickens squawking by the clothesline. Now that’s a farm. At the farmers’ market, I’m finding myself bewildered. West Chop Inner Tea. What makes it inner? And when did they start growing tea in West Chop? Then there’s Katama Chamomile, “an especially calming blend.” What if my insurance doesn’t cover it? When it’s 93 degrees outside, I find myself longing for a supermarket. It’s always Antarctica in the Cronig’s produce section. And while their employees don’t feel obliged to lecture you on the life cycle of a parsnip, they will point out the potato counter. (They call them potatoes, not fingerlings. Potatoes as in salad, baked, mashed.) None of the staff seem interested in sharing tips of how to rid your garden of slugs, but there are shelves of admittedly the most un-organic pesticides. I stop at another farm stand and read the poster for “Pork Belly, Pork Chops, Loin Roasts and Country Ribs.” A man mentions there’s a new litter of piglets at the Farm Institute. The cutest, an orange one, is called Sweet Potato. I ponder the name, then it hits me: Sweet potato will one day be loin roast and then it is all becomes too much. How can I ever reconcile my love for pork with my fondness for cute? I reconsider my carnivore ways, reflect on Ghandi, Babe and Tofu, then head next door for a popover. She’s right. And I’ve never realized it before. I end up at Island Bees, where bee-ziness is booming. The varroa mites plaguing bees around the world is not a problem on the Vineyard. The bees are thriving here. And so, in its own way, is the West Tisbury Farmers’ Market. Ted Sutton lives in Newton and Aquinnah.